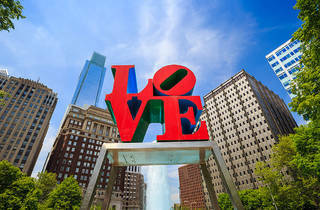 “Love Park” (officially John F. Kennedy Plaza) takes its nickname from Robert Indiana’s famous Love sculpture, which sits proudly at its center. 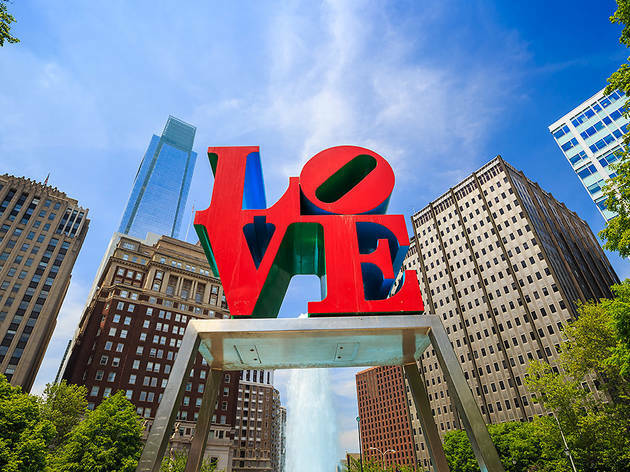 One of the most photographed objects on the East Coast, the iconic pop art piece stands within feet of City Hall—fittingly, right at Philly’s heart. The plaza was created by renowned city planner Edmond Bacon, father of the actor Kevin, and also has a large fountain which regularly changes color to commemorate or celebrate events. Directly across the street is brand-new Dilworth Park, a lively urban garden with four curated tree groves, lush lawns, a Jose Garces café and another fountain, which converts to an ice-skating rink in winter.